Why do waves of the U.S. shale gas revolution not cross over the Atlantic at least until the end of this decade? In March last year, speaking at a press conference in Brussels after the US - EU summit, the U.S. President B. Obama told European leaders that the US could provide all of the natural gas Europe needs on a daily basis . Obviously, these promises, as the US had expected, should strengthened the EU intentions to boost the energy security by reducing Europe's dependence on Russia. A significant decline in Russia's market share in Europe was one of the main objectives of the EU Energy Security Strategy adopted in the late spring of last year. The spring will come soon again; a whole year is nearly over after these events. Let us look at what has changed in favor of ensuring the European energy security for the period from the spring of last year. Among the practical steps completed last year against Russian gas imports to the EU it especially stood out that Bulgaria did not give construction permits to build the South Stream pipeline seriously affecting the European energy security but, unfortunately, not for the better. Now the fact that some of the most vulnerable South East European countries lost an opportunity of obtaining in the end of this year Russian gas by first of four lines of the canceled pipeline South Stream with an annual capacity is up to 16 bcm has far-reaching consequences, which are considered differently. This gas will not come to Bulgaria. Moreover, the former risks of energy security for the country remain, because 85% of the gas consumed by Bulgaria, imported from Russia through the Ukraine's war-torn territory. Cancellation of the pipeline South Stream made the EU initiate a special working group to discuss what actions the countries - former participants of the South Stream project might undertake in the present situation. Although following the results of its first meeting in Sofia it was not clear what Bulgaria would receive instead of lost opportunities to strengthen its energy security as well as missed investments into the Bulgarian section of South Stream project and foregone earnings from gas transit. The European Commission promises to Bulgaria only legal and expert support in future gas projects, which, as the Vice-President for Energy Union Maroš Šefčovič pointed out at the working group meeting, can occur within two to three years. In the meantime, the US openly celebrate their victory over the South Stream project. "The battle was won," the US Secretary of State John Kerry told the staff of the American Embassy in Sofia. "And here we are today in 2015, and Russia is still trying to impose on people its will." However, such an enthusiasm does not correspond to what has been expected by Europe and what Europe is waiting for now. Indeed, it is unlikely such "victories" somehow can help European countries to make progress in achieving strategic goals of energy security. Therefore, in this situation, Brussels has even more actively to look for opportunities for enhancing energy security in two main directions: firstly, substantive constraints on the overall demand for fossil fuel like natural gas and, secondly, a significant increase in supply from alternative sources. At the same time, we must realize that both search logic of such alternatives and identification of best options for energy supplies should be based on the principles of competition so highly respected in Europe as cradle of the market economy. As we may see in current reality, the EU energy market has turned into one of the arenas of confrontation between the US and Russia, which is now openly declared by the US officials. This indicates that Washington is openly taking control of the future of the European energy market. Amos Hochstein, the US State Department’s special envoy for international energy affairs has recently said that the U.S. would like to see a 20 percent slice cut out of Russia’s current share of the Eastern European gas market by 2020. In fact, with the absence of "the spur of competition" between gas suppliers at the European energy market our consumers would lose benefits of better prices, attractive commercial terms of delivery and much more. It is not difficult to see that the US competition with Russia for the European gas market does not comply with the traditional model, which should be aimed at the interests of end users of gas in Europe. According to this model, only Russian side presents such usual evidences of competitiveness for consumers, as many years’ experience in supplies of gas to Europe, security of supplying extended volumes based on huge gas reserves in Siberia and on the continental shelf in the Arctic. It might be well to add the rejected investments of the Russian company "Gazprom" into the South Stream gas pipeline now went off the prospects for development of Eastern European gas transport infrastructure. What do the US competitors undertake in the rivalry for European gas market from their side? In the first instance it is a political pushing through Brussels, and, if necessary, directly through the governments of the EU Member States such bureaucratic decisions that should hinder the activities of their competitors. Besides, probably for maintaining the competitive image, it was promised that American companies would bring to Europe new investments and technologies on waves of the US shale boom, which will cross the Atlantic approaching European gas market rather soon. Unfortunately, the role of Brussels in the US competition with Russia is often not consistent with vital economic interests of European gas consumers - both business owners and households. As usual agreeing with the Atlantic allies, Brussels without hesitation accepts the proposed transition to much more expensive North American shale LNG even though the starting date of its supplies to European market has not conclusively determined yet. Brussels in turn has recently reminded the US of the necessity to implement the idea of supplying Europe with North American LNG. “Energy needs to be a key part of Trans-Atlantic Trade and Investment Partnership discussions” the EU Climate Action and Energy Commissioner Miguel Arias Cañete said at the Atlantic Council meeting in Washington. “We need gas to be traded freely across the Atlantic”. Meanwhile there is no any certain reaction to this reminder. The problem obviously is that the promises made by President B. Obama have proved difficult to implement in practice. Actually now there are real obstacles to shale LNG exports from the US to Europe. First, American companies should be allowed to deliver shale LNG to Europe, since now it is banned. The “Export American Natural Gas Act of 2015” was assigned to the US congressional committee on January 21, 2015 and it was made not for the first time. The initiators of the bill point out that it should speed up the procedure of permits for export of LNG assigned to the US Department of Energy. Apparently, opponents of the bill, including experts from the Department of Energy, who have held up this legislation up to now, better aware of the complex problems in the US shale industry, which are hiding behind the facade of diagrams showing an optimistic growth in shale gas production. There are serious concerns that the export of shale LNG can only aggravate the problems, which have long been objectively increasing within upstream sector of the US shale industry. In the meantime, due to the unique character of the US shale industry and the extent of its influence on the international energy market, the existing problems in the upstream sector deserve special consideration that is better to do separately but now let us turn back to the prospects of the shale LNG supplies to the European market. Apart from the above-mentioned absence of the legislation, next barrier existing on the route to Europe concerns a delay in development of the transport infrastructure needed for shipping LNG from the US. In this case, the problem is that construction of LNG terminals in the US is losing its investment attractiveness because of the drastic drop in oil prices. Now more than 14 projects of LNG terminals in the US happened to be under the threat of suspension of construction. A low level of oil prices undermines both prospects of shale gas production and development of infrastructure for the transportation of LNG from the US. Contracts for North American LNG are closely correlated to the price of gas in the Henry Hub - а distribution hub on the natural gas pipeline system in Erath, Louisiana, where the nine largest interstate pipelines converge together. At the same time, LNG prices of competing suppliers from Australia, Qatar and other countries are calculated based on oil quotations. When oil quotations were over 100 USD per barrel LNG export from the US had certain advantages over competing supplies from terminals in other regions of the world, but in consequence of collapse in oil prices to a level of 55 USD per barrel for WTI and 60 USD for Brent these advantages disappeared. Changes for the better are not expected. Moreover, a new report of Citigroup, published in February this year predicts that "West Texas Intermediate Crude, currently trading at about 52 USD per barrel, could fall to 20 USD “for a while” until the current supply glut is worked off". With regard to the readiness for unloading the North American LNG on the European continent, here the situation is not much better. Only Western European countries possess the necessary LNG terminals and regasification facilities. As to South East Europe, in these countries the LNG infrastructure is completely missing because initially a local gas transportation system was intended for the consumption of pipeline gas from Russia. 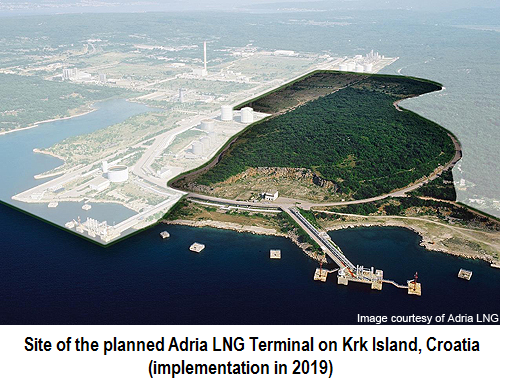 It is planned that the first LNG terminal in South East Europe will be Adria LNG Project in Omisalj on the northern Adriatic island of Krk that will has a regasification capacity of 10 bcm per year. According to the EU Energy Security Strategy, adopted in Brussels, this project is expected to launch in about five years in 2019. Thus, the facts indicate that the US LNG might actually appear at the European market and particularly in South East European countries only to the end of this decade. Why do politicians urge us to believe on their bare words that despite the existing problems the North American shale LNG will be able soon to put competitive pressure on Russian gas at the European market?